It is Week Three of the One Room Challenge, and I’m so excited Linda at Calling it Home opened up the fun to everyone! I am delighted to be linking along. If you missed my first two posts, click here for Week One and here for Week Two. Based on the feedback from last week’s update, I think it is safe to say that many of my fellow design enthusiasts and designers are THRILLED to finally have a more affordable outlet for hand-painted silk Chinoiserie wallpaper and panels. I’m so pleased with our wallpaper that I’m considering having a pair of panels made for our master bedroom. I am always on the lookout for a bargain and today, I’m delighted to share a few of my eBay and Craigslist finds that will help complete the luxurious look I have envisioned for our powder room/cabana bath. Let’s start with the deal of the century… Our Sherle Wagner marble pedestal sink, which was installed last week. Behold this work of art! We purchased this sink via Craigslist from a contractor who salvaged it from a Palm Beach manse… for $250. Yes, $250!!! This sink is solid marble, and it weighs about 350 pounds. It is still available through Sherle Wagner, and upon request I learned that it retails for $22,176… Holy Cow! That’s a $21,926 savings! In addition, the sink came with a Sherle Wagner faucet, which I had re-plated through Mark Plating in Palm Beach, and relocated upstairs. I have always coveted the Sherle Wagner Cherub Basin Set but it retails for over $3K. So I found ours on eBay for a song – in like new condition! It is gold plated and positively exquisite. I’m also thrilled with how beautifully the marble sink matches our marble tile. I searched high and low for a near perfect match, and finally selected “Parisian Ivory” from Marble of the World.The cherub faucet looks lovely with the petite vintage cherub chandelier I found for $120 on eBay. The vintage sconces, which I wrote about last week, were also an eBay find… a steal for $250! I know I promised an update last week on a DIY project, but I actually need your help. I may be great at finding bargains, but I stink at DIY! I found this gorgeous mirror via Craiglist, but I do not like the crackly gold finish. I want to gold leaf it. I read this gold leaf DIY post over at Little Green Notebook, and then I read this post at vmac+cheese, and I panicked. Umm… I don’t think this is going to work out with all the carvings in my mirror. So after a bit more research, I stumbled upon liquid gold leaf. After watching this YouTube video, I think this might be the perfect solution! Have any of you ever used liquid gold leaf, and if so, do you have any tips? We also had our toilet installed last week – “Memoirs” by Kohler in Biscuit. Although, the flush needs to be swapped from polished chrome to brass. Stay tuned next week to see if I have survived my DIY, and as I continue to hunt for accessories to complete our powder room! And don’t forget to check out the updates posted yesterday by the 20 ORC participants along with a few of my favorite linking party participants, which post today. Exquisite! Really so elegant…I can not wait to see the final touches! I just sold my butterfly painted Sherle Wagner basin sink a few months back, loved it and it had a good run in our powder room, but I love this pedestal sink it's gorgeous! Love the art deco lines and the large rim, what a fabulous find! Your bathroom is turning out amazing!! Holy cow. That's all I can say. Fab. I'm so thrilled to see these STUNNING finds you've hinted about. The bathroom is coming along better than I could have imagined. Absolutely thrilling to see. So, so, perfect! That is the swankiest, bestest, most awesomest bathroom I have ever seen. I would love to move in. Please, please, pretty please. GORGEOUS!!!! Liquid gold leaf is easy peasy. Just paint it on. I just let out a gasp when I saw that sink, I have never seen anything like it in my life, ahhh, please let me wash my hands there! That is INSANE about the sink/faucet! Great snag! I emailed the company in China about ordering some panels similar to your paper – no response. Do you have any suggestions?? I want your bathroom! Seriously I do! What an incredible and awesome find in that sink with the faucet included – I almost don't believe you – I mean who finds something like that!! Years ago I was walking into a plumbing showroom with a client and we spotted a gold cherub faucet very similar to the one you have and my client made a comment that she thought they were gaudy and I thought how on earth am I going to help this client choose anything if she thinks that. I adore your faucets. I am loving that mirror just the way it is! Goodness and that wallpaper. Okay that is enough envy! Your bathroom is looking beyond amazing and you are a fabulous finder of great deals. Love how it is all coming along!!! I love that sink!!! The faucets make it even better! Love it!! Love the sconces too! I'm so excited to see the whole thing when it's done! OMG! That sink is amazing and I can't believe you got it for 250. Killer! Good luck with the mirror, I'm looking forward to hearing more about your process. The sink. I can't even. It's stunning. Everything is coming together flawlessly! You just blew my mind with that sink. You are so good my friend! I haven't tried liquid gold leaf, but it sounds like it could be a great solution! Holy guacamole! Dang girl you are rockn' the bargain basement of elegance. How in the heck??? The sink, the floor & chandy are Supercalifragilisticexpialidocious! Oh my that sink is GORGEOUS! Cannot believe the bargain you got!!! Also love the cherub faucet as well as the chandelier! I am so not a DIY person either…I wish I was, but sadly I did not get the "crafty" gene in my family. Curious to see how the mirror turns out…I may try it on my dining room mirror if you have good luck! STILL cannot believe the deal on the sink!!! You go Girl! What a score, I can't wait to meet up and shop one day. I like liquid gold leaf and it is great idea. I have done the sheets of gold leaf, and you should not do it on this. Can't wait till next week. I am so trilled to see the sink! I am sure you were so excited to find it and at that price. Wow! Can't wait to see how the mirror turns out. Good luck. That is, without a doubt, the best Craig's List deal I've EVER heard of! Incredible! It looks amazing!! You have got to be kidding me ~ everything is already over-the-top amazing!! I cannot get over your bathroom – it is amazing!! That sink may be the deal of all deals…simply exquisite!! Super glam-glam and gorgeous! Dying over everything you've put in the space – and we're not even done yet! OMG! That pedestal sink is truly a masterpiece! And for $250????!!!! You are really lucky! Your bathroom is looking like so posh!!!! This is so so glam!! wow! I'm just speechless, Andrea! You are a pro at finding amazing items!!! I cannot believe the deals you're able to find. You're going to have the prettiest powder anywhere! WOW!!! You could practically buy a small car w/your savings on the sink and faucet. Your powder room is going to be amazing. Whoa, that wallpaper is on fire. So loves it. And you are quite the Queen of savings. What a freaking steal on that marble sink. Good lord. I think that might be the most beautiful sink I've ever seen. And a five-figure savings? Amazing! good gawd that sink!!! amazing find andrea! Just discovered your blog, and you're killing me! Gorgeous! At a loss for words. Featuring your bathroom in my next post. Can I please just say. You are a mastermind genius. I'm talking design and I'm talking savings. You are TOOO GOOD. OMG- wow! 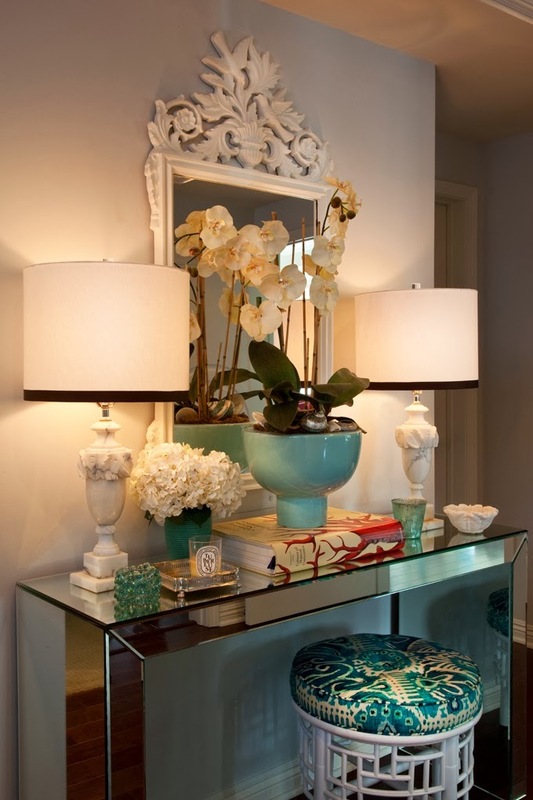 I am floored with how gorgeous your powder room is….Gorgeous!!! That sink is the steal of the CENTURY!!!!!!!!!! How do you find these things? Is there a knack or tips for finding this unreal deals? Do tell! So very beautiful! That is a crazy good deal on the sink – I've never heard of such. I didn't think you could out-do that beautiful paper, but the sink is pretty close. Re: liquid gold leaf, I have used it but mainly on smaller projects. But, it is very easy to use and literally just brushes on. There are some different finishes and I can't remember exactly but I think the one I like is called Classic Gold, maybe. Good luck! Wow! Looks amazing and that sink….I have no words. It is so Art Deco. I love it! !